I need to do something different with this blog. I have been thinking about it for quite a while. This is my 836th post over the course of 8 or so years. I originally started blogging because it was new technology and a new way to communicate. It was novel. Now it is mature. I was impressed by the USAIR flight that ditched into the Hudson river the other day. Everybody was unhurt. Wow!! I understand that the aircraft has a "Ditch Switch" that is thrown to seal through-hulls and helps it float a lot longer. That must have helped. The event was definitely impressive in a lot of different ways. I am surprise the engines didn't rip the craft apart when they hit the water. I wonder what the angle of attack was like when it first contacted the water? My flight instructor and I have discussed the philosophical aspects of what our reactions will be in absolute emergency situation like that one. You never really know until it actually happens. A big part of flight training is learning about planning and anticipating emergencies. Preparing yourself for the inevitability of surprises and technical issues is a big part of things. You may learn a lot more about yourself than you might first think. I know it has been great for me. The weather has been downright cold for quite a long time now. We must be 3 weeks below freezing. The past week has been below zero. This morning it was 15 below zero. I was expecting 20 below. The llamas were out running around in the 15 below, but they run back into their shelter with mats, heat lamp, straw, water and feed. Ruminating animals have a advantage in the cold over no-ruminating animals. The digestion process is a composting activity and heat is given off by the feed in their stomachs. Non-ruminating animals only get heat from the chemical reactions as part of body functions. So the ruminators have in effect a small heater inside and the non-ruminators are the heater. Get the picture? 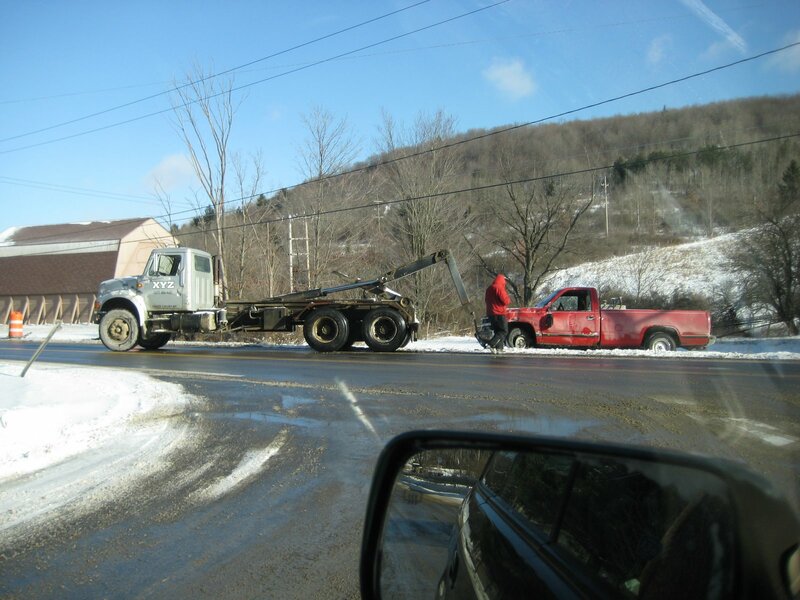 There have been lots of wrecks around. 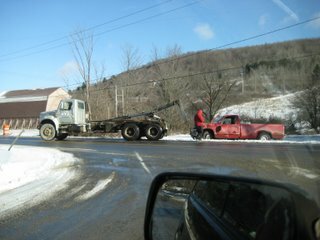 The pick up below is this month's candidate in smashing into the guide wire on route 26 near Glen Aubrey NY. That thing seems to get gets hit a least once a month. The road curves. Vehicles don't. Simple.